Previous post: That Stencil Can Do What? Spray inks have a mind of their own so I can never control exactly what will happen. Letting go of that control allows me to get out of my own way and just play! All the juicy spray inks run where they want to run, letting colors mix and mingle giving me a happy surprise every time I lift the stencil. This quick video shows how I used the Trio of Houses stencil and Dylusion’s spray inks along with a very special secret ingredient to get this look. Okay, not a secret if I put it in a video…and if it comes right out of the sink…. Watch Letting Go of Control with Spray Inks and a Stencil on YouTube. As a bonus, using up every last drop of ink gave me this wonderful mess that will become the background of an art journal page. Sharing with my friends at Paint Party Friday, Creative Every Day, and Art Journal Every Day. My newsletter is heading out in a few days to everyone signed up. Not signed up yet? Just click here to get signed up and get access to a free downloadable video and pdf showing you 3 simple ways to thwart that inner critic. Great technique and AMAZING new stencil, Carolyn!!! Looks amazing with this great stencil!!! I love this stencil as well, and of course the technique! That is a MUST HAVE stencil! Love what you did with it! Oooo, I love this page! It’s all foggy and smoky looking–beautiful!! This technique is so neat!!! love it!!! Happy PPF and I wish you a wonderful weekend!!!! 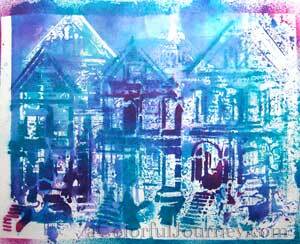 wonderful colours with your new stencil, which is fab by the way, loving those houses. Carolyn, this one got a great big WOW out of me when I pulled up your site. Beautiful. 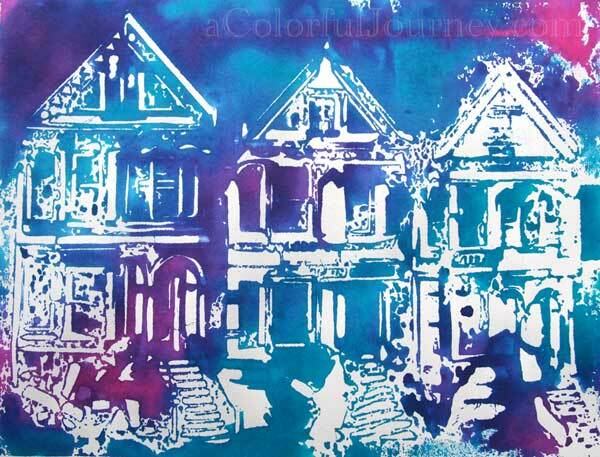 what a perfect stencil to use with these colors and technique-fabulous Carolyn!! So cool, I adore it! This is a lovely artwork, and reminds me so much of both Cape May and Ocean Grove, both here in NJ. Thanks for sharing your technique via video! So cool! Love how you used it three times!! Awesome stencil and the picture looks great! Wonderful colours. Great stencil, those houses look fabulous. Gorgeous piece Carolyn!!! Did I say Gorgeous? I meant absolutely gorgeous! Those colours are the best and go Perfect with that absolutely fab stencil of yours!!! Love it and tfs your secret! I love it, especially the reverse image. I’ve gotten to the point where I don’t even use a stencil as it should be, but using the reverse image. However, I have not used the regular image and the reverse image on the same print, so will have to have a go at that. I love that image from stencil girl and you use of it! That’s one fantasmic stencil! Love how you played with Dylusions too.